Washing and drying our clothes can take a lot of time, energy and money. For those of us with large families or those who live in an apartment without laundry facilities (and therefore must use the Laundromat) our costs increase even more. There are some simple ways to decrease these costs. For example, making our own detergent using affordable and natural ingredients can save us money with the added benefit of a chemical-free laundry. Also, we can ditch the dryer altogether. Hang drying our laundry drastically reduces the amount of energy we use. It is also better for the environment. Even using the cold setting on our washing machines saves energy and is good for both our clothes and wallets. It may not sound like much, but just a few easy changes to your routine can result in substantial savings over time. 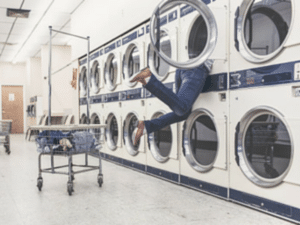 If you need to cut expenses in the laundry department, or are looking for extra ways to save, check out these 5 Ways To Slash Your Laundry Expenses, thanks to Bargaineering.